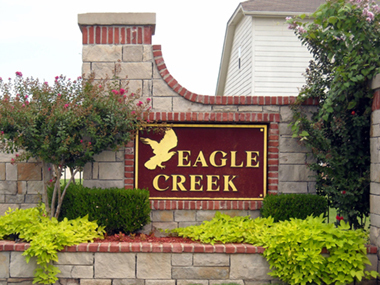 Eagle Creek is a neighborhood located in East Broken Arrow. The neighborhood encompasses 680 homes and two interior parks. There is retail shopping and restaurants conveniently located within several miles There are also two community centers with public parks and pools nearby. The Broken Arrow school district is exemplary and has great programs to help educate your children. Eagle Creek has a mandatory homeowners association. This helps create and maintain the highest level of excellence where you live. You can also visit our Facebook Page by clicking on the Facebook icon in the top right hand corner of this page. Thank you for visiting us online and we hope to see you soon. The Eagle Creek HOA is actively recruiting volunteers for a neighborhood watch program. Volunteering is easy. We need your ideas to help roll this program out effectively. We ask everyone to look out for signs of trouble such as vandalism and burglary and report it immediately to the police or sheriff's department. The Broken Arrow police department non-emergency number is 918-259-8400. Of course, if you or someone else in in danger, hurt or being threatened, please call 911. To become a volunteer, contact us at watch@eaglecreekhoa.com today. Neighborhood Watch programs serve as the eyes and ears for local law enforcement agencies because they are composed of volunteers, paying close attention to the community in which they live and know well. By serving as a contact for residents who may have concerns about neighborhood safety, volunteers can be an effective link between citizens and the police or sheriff's office. Neighborhood Watch programs are not meant for spying on residents, reporting on homeowners association violations or getting revenge on obnoxious neighbors. Watch programs that work with local law enforcement agencies stick to a particular philosophy of looking out for signs of trouble, people in need, or criminal activity. Please contact us at watch@eaglecreekhoa.com if you would like more information.